Archis Mohan and Aashish Aryan report. The Narendra Damodardas Modi government's late night order authorising 10 central agencies to intercept, monitor and decrypt information contained in 'any' computer system rocked Parliament on Friday, December 21, with the Opposition terming it an assault on fundamental rights. 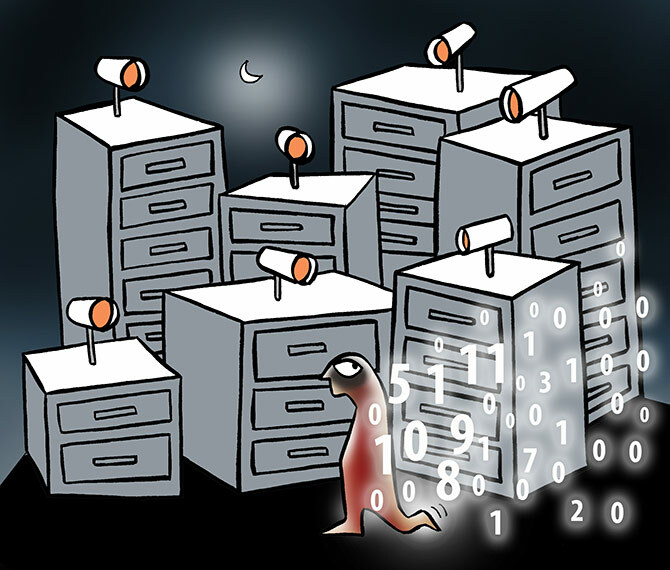 The Congress and other Opposition parties also accused the government of trying to turn India into a "surveillance State' by resorting to 'snooping'. The government, however, dismissed the charges and said the new order 'does not confer any new powers' to any security or law enforcement agency, and that the authorisation was given under 2009 rules. It said the Opposition was playing with national security and 'making a mountain where even a molehill doesn't exist'. It looks imminent, though, the battle on the issue will be fought in the Supreme Court in the coming weeks, particularly in the context of the apex court's judgment on the Right to Privacy. In the Rajya Sabha, Leader of Opposition Ghulam Nabi Azad alleged that an 'undeclared Emergency has taken final shape' and 'all federal agencies have been let loose'. Finance Minister Arun Jaitley, who is also Leader of the House, countered the allegation, saying the Congress was crying foul over powers created by it when it was in government. Congress President Rahul Gandhi slammed the PM over the issue. 'Converting India into a police State isn't going to solve your problems, Modi Ji. It's only going to prove to over 1 billion Indians, what an insecure dictator you really are,' he tweeted. West Bengal Chief Minister Mamata Banerjee said 'blanket surveillance' was bad in law. Cyber law expert Pavan Duggal said the government was well within its rights to issue such a notification as the Supreme Court had upheld in 2015 the legal validity of Section 69 of the Information Technology Act. "However, with the top court's judgment later declaring the Right to Privacy a Fundamental Right, the powers under the provision need to be looked afresh. To utilise such sweeping powers in the right manner will also be a challenge," said Duggal, president of Cyberlaws.net. Thursday night's order was brought out by the home ministry's 'cyber and information security' division under the authority of Home Secretary Rajiv Gauba. According to the order, 10 central security and intelligence agencies are now authorised to intercept and analyse any information on any computer system under Section 69 of the IT Act, 2000. The agencies notified are the Intelligence Bureau, Narcotics Control Bureau, Enforcement Directorate, Central Board of Direct Taxes, Directorate of Revenue Intelligence, Central Bureau of Investigation, National Investigation Agency, Research and Analysis Wing, Directorate of Signal Intelligence (in service areas of Jammu and Kashmir, the north east and Assam), and the Delhi police commissioner. In a clarificatory statement, the home ministry said adequate safeguards were provided in the IT Act, and similar provisions and procedures already existed in the Telegraph Act along with 'identical safeguards'. The ministry said 'each case' of such computer interception, monitoring and decryption was 'to be approved by the competent authority, which is the Union home secretary'. 'The present notification is analogous to the authorisation issued under the Telegraph Act. The entire process is also subject to a robust review mechanism as in the case of the Telegraph Act. Every individual case will continue to require prior approval of the home ministry or state government. The MHA has not delegated its powers to any law enforcement or security agency,' it said. It provides that 'the competent authority may authorise an agency of the Government to intercept, monitor or decrypt information generated, transmitted, received or stored in any computer resource for the purpose specified in sub-section (1) of Section 69 of the Act', according to the ministry. Therefore, it said, the latest order had been issued 'in accordance with rules framed in year 2009 and in vogue since then and no new powers have been conferred to any of the security or law enforcement agencies'. The notification, it said, has been issued to notify the ISPs (Internet Service Providers), TSPs (telecommunications service providers), and intermediaries, among others, to codify the existing orders. According to the 2009 rules, all cases of interception or monitoring or decryption are to be placed before a review committee, headed by the Cabinet secretary, which shall meet at least once in two months to review such cases, the statement said. In the case of state governments, it added, such cases were reviewed by a committee headed by the chief secretary concerned. Section 69 of the IT Act deals with the 'power to issue directions for interception or monitoring or decryption of any information through any computer resource'. According to an earlier order, the Union home secretary is also empowered to authorise or sanction intelligence and security agencies the tapping and analysis of phone calls under provisions of the Indian Telegraph Act. In the Rajya Sabha, Congress leader Anand Sharma said the issue was serious as it was related to fundamental rights and 'India will become a police State' with such 'sweeping powers' to agencies to intercept information. He said the rules under which agencies would be authorised to intercept information were framed in 2009 when the Congress-led UPA was in power. 'So what you are doing Mr Anand Sharma is making a mountain where even a molehill does not exist,' he said. Outside Parliament, the CPI-M's Sitaram Yehcury said the order was unconstitutional.